In the Alpha, I played a female Void Elf Warlock (an Alliance Allied Race). 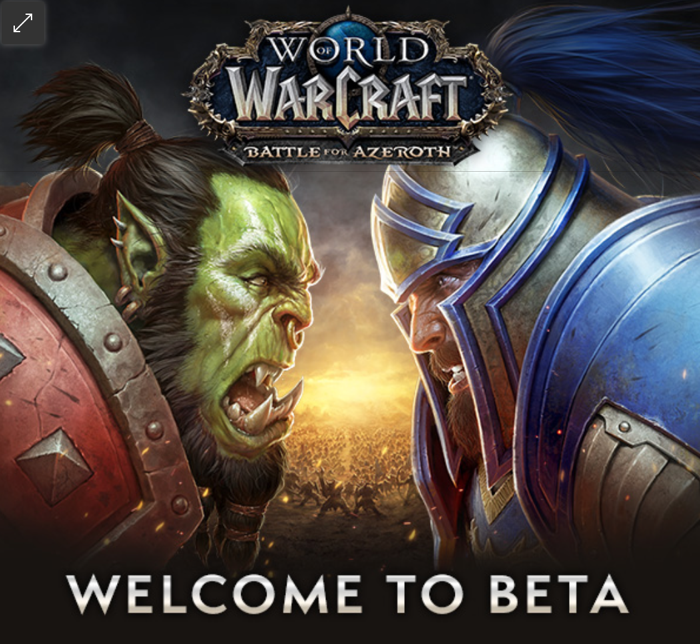 For the Beta, I decided to go Horde. 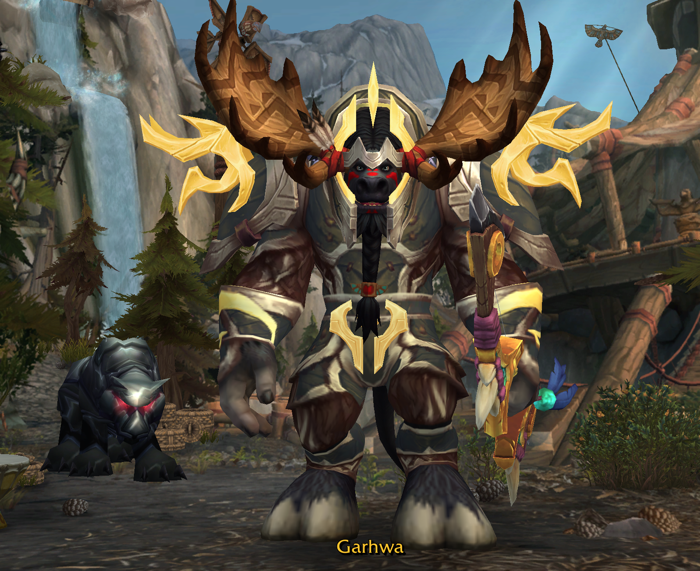 Garhwa is Highmountain Tauren Hunter. His name came from the random name generator. 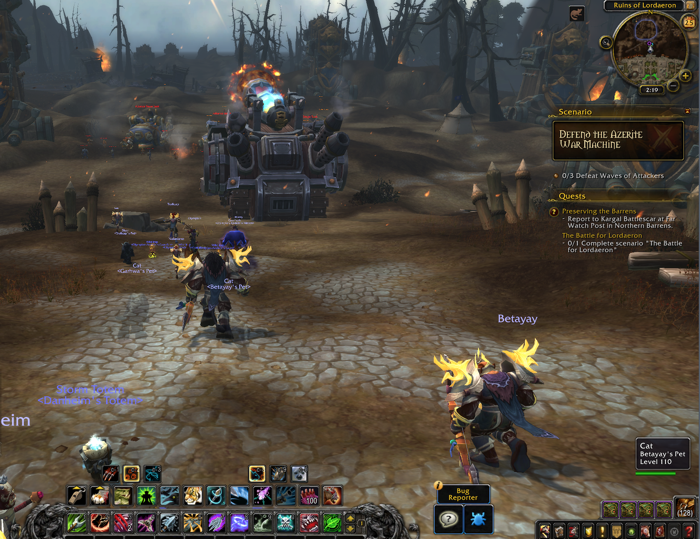 In this screenshot, my Highmountain Tauren is supposed to be Defending the Azerite War Machine. This part of the battle was super fun and reminded me of the Invasion events right before the Legion expansion was released. We are all working together on the same thing at the same time – and there were tons of players involved! The Highmountain Tauren following my character is named “Betayay”. Gotta love the names people give characters in Betas! 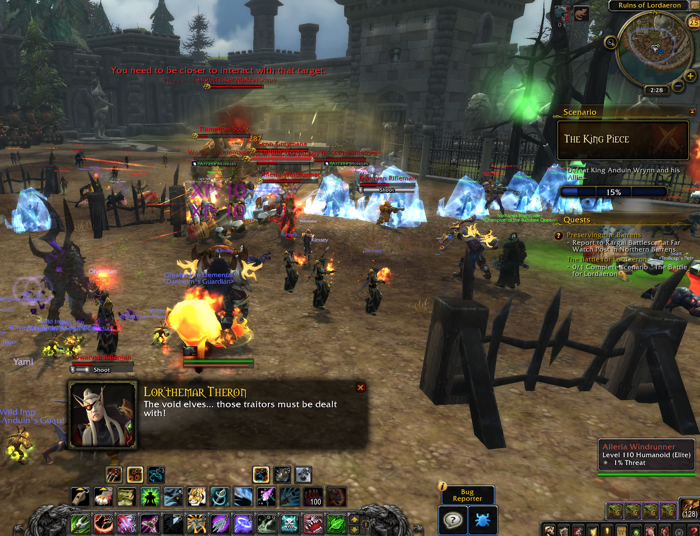 While the battle was going on, I realized that all of the player characters involved were Horde. We were not fighting players who were Alliance, though. We were fighting NPCs (non-player characters). This surprised me. I was expecting that the Battle for Azeroth expansion would force Alliance players and Horde players to fight each other in the significant battles. Then again, if Blizzard set it up that way – it might shift the outcome. As this battle went on, it seemed to me that Blizzard intended there to be a storyline that concluded in a pre-determined way. So, it’s a bit scripted, but still incredibly fun! The skeletons are going into battle – and I am suddenly reminded of Army of Darkness. I found a “bug”! The two Forsaken Blight Throwers in front of Garhwa have merged into one. That’s not right! In this part of the battle, we are fighting against High Tinker Mekkatorque’s flamethrower machines. All of the important NPC’s have things to say – and I could hear some of them (but not all of them). The text appears and seems to match with the vocals. Lor’Themar Theron: The void elves… those traitors must be dealt with! When the Allied Races were first announced, it seemed to me that the Void Elves looked like Horde characters. But, they were on the side of the Alliance. The comment from Lor’Themar Theron indicates that the Void Elves started out on the side of the Horde, and then switched. I would like to hear more about how, and why, that happened. Part of the battle involved fighting Alleria Windrunner, Anduin Wrynn and Genn Greymane. As you can see, Alleria was down to about half of her health. The other two took no damage at all. 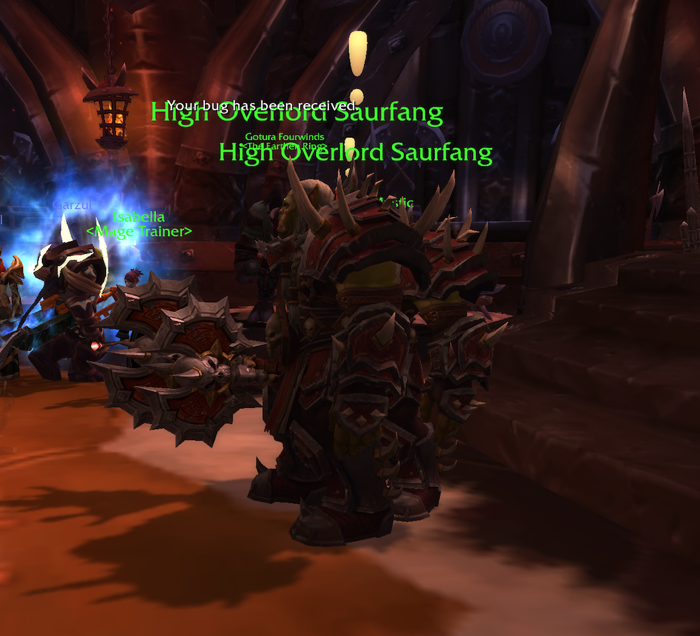 High Overlord Saurfang has a double. That’s definitely a “bug”! See that little glowing thing on the table? That’s the bottle that Nathanos Blighcaller wanted the “team” to pick up. I couldn’t see it at first because of all the other players who were surrounding the table. I had something similar happen in the Legion beta where a bunch of players were gathering to complete a quest that involved clicking on an object. It wasn’t a “bug”. I followed Nathanos and some NPCs out of the building – and then they all disappeared. This left me completely confused about where to go to finish the quest. The Swift Red Wind Rider mount looks awesome! 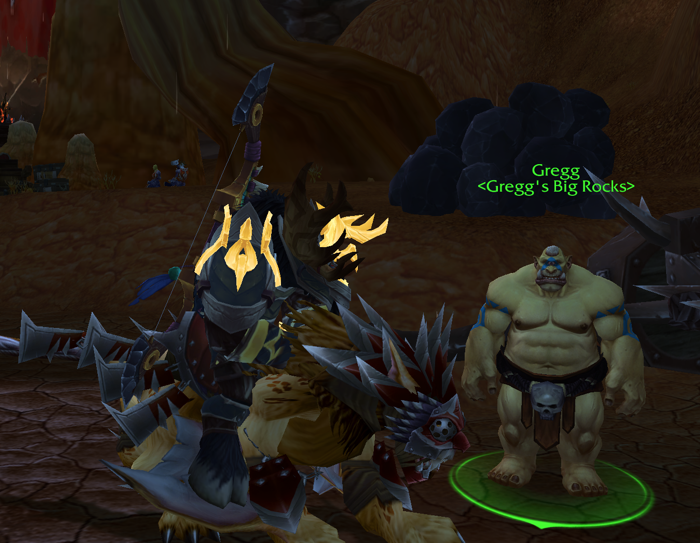 I found Gregg (of Gregg’s Big Rocks) outside of Orgrimmar. He’s a simple guy who seems genuine about wanting to join the Horde. This was the point where I got lost, although I didn’t realize it at the time. I think the quest I picked up outside of Orgrimmar was supposed to connect with a Legion thing that I ended up getting stuck in. One of the NPCs mentioned something about the Broken Shore – which should have been a clue (but I completely missed it). In the video above, I managed to figure out where I needed to go to complete the Stormwind Extraction quest. Shortly after putting myself on the right path – the game crashed. 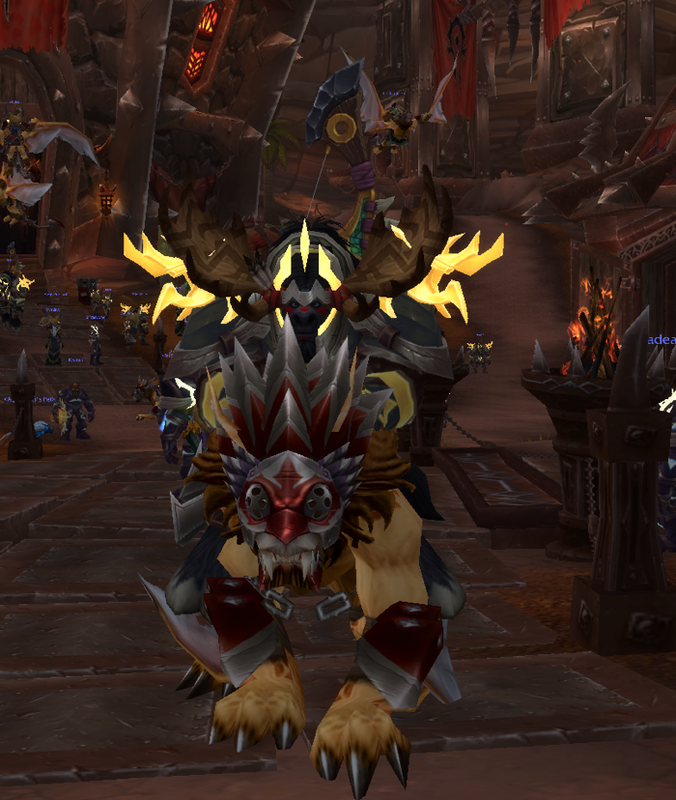 After re-launching the World of Warcraft Beta, it looked like my Highmountain Tauren ended up in Stormwind after all. Once things got moving, it was pretty fun. 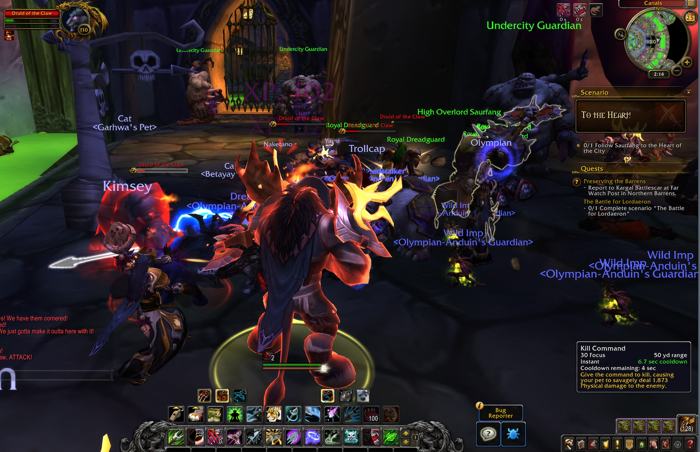 Blizzard has decided to present narrative to the player by way of dialogue said by NPCs. It all appears in text “speech bubbles” over the character’s heads – which is fine, if you can keep up with them. Some of the NPCs have audio relaying their speech, but not all of them do. I figure the live Battle for Azeroth will have full audio dialogue. I found an interesting NPC in the Stormwind Stockade. There’s a woman in a cage with a Hogger costume sitting outside the cage. This is based on a real person – Laura Mercer – who won the BlizzCon 2017 Costume Contest as Hogger. 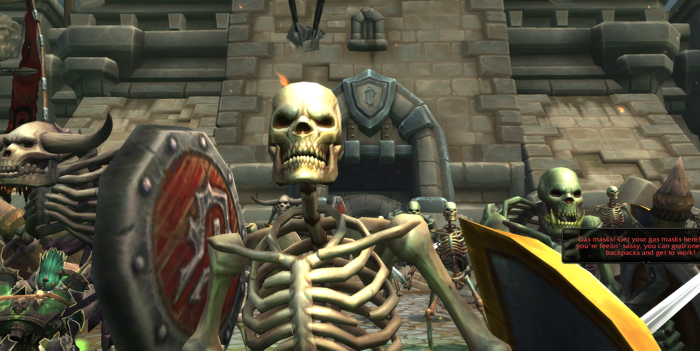 It was fun to run through the Stormwind Stockade as a Horde character. It wasn’t until much later that I realized the the NPCs and I were on a “save the princess” quest. Not sure what I think about that, especially considering that I’m probably missing some storyline. The battle on the boat during the final state of the Stormwind Extraction quest was a bit confusing. I wanted to fight the mob that was trying to to get on the boat. 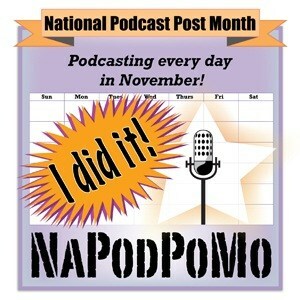 But, my NPC party disappeared. Eventually, I figured out that I wasn’t supposed to fight the mob – I was supposed to talk to the Princess on the boat. In this part of the game, Blizzard decided to convey narrative to the player by having the important NPCs provide it. 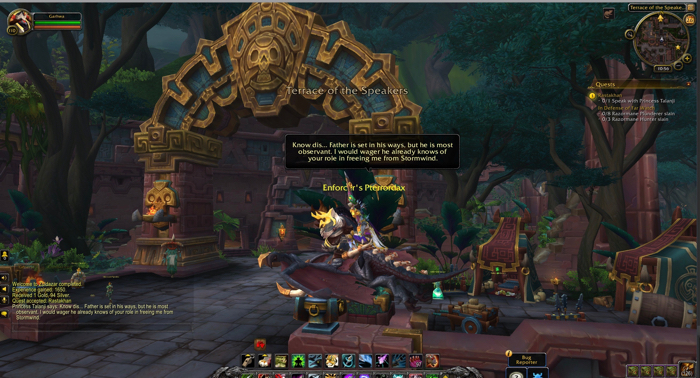 As an example, in the above screenshot, my Highmountain Tauren is flying through Zuldazar with Princess Talanji – who is telling my character about her father, the King. I like that Blizzard is doing this. It allows a player who has very little idea of the storyline or lore of this area to learn about it while playing the game. Players don’t have to leave the game to find the missing pieces of a story. On the other hand, I cannot help but wonder what this does for re-playability. The first time through is informative and interesting. 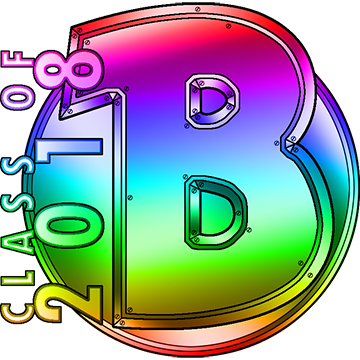 Would a person who takes 10 alts through this content get very bored with it? 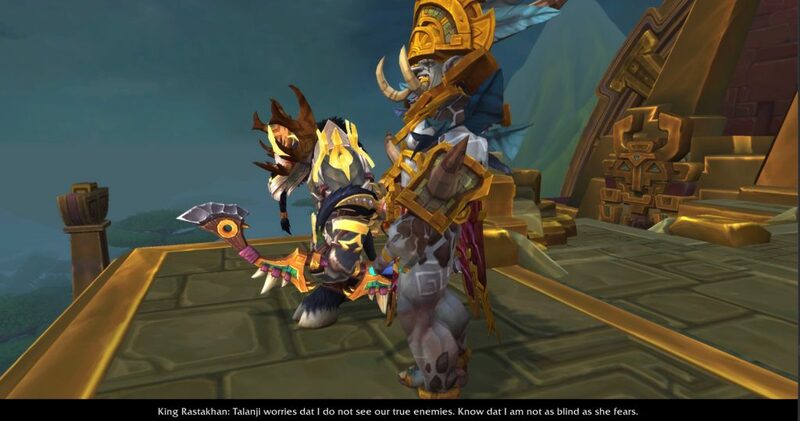 Garhwa, my Highmountain Tauren, meets King Rastakahn. This takes place during a cinematic where the players character appears right next to the very important NPC. There is a moment when I wasn’t entirely certain if King Rastakahn would talk to Garhwa… or throw him off the building! 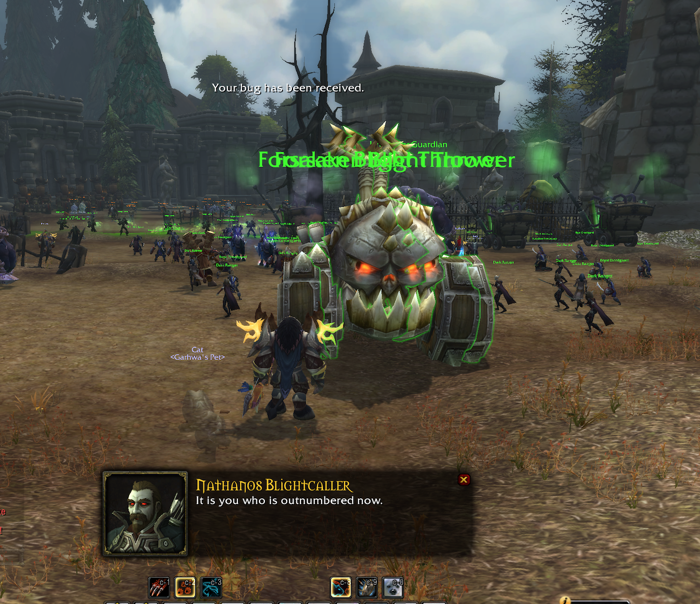 The player character gets the title Speaker of the Horde. Click on the banner, and it turns into a Horde banner. 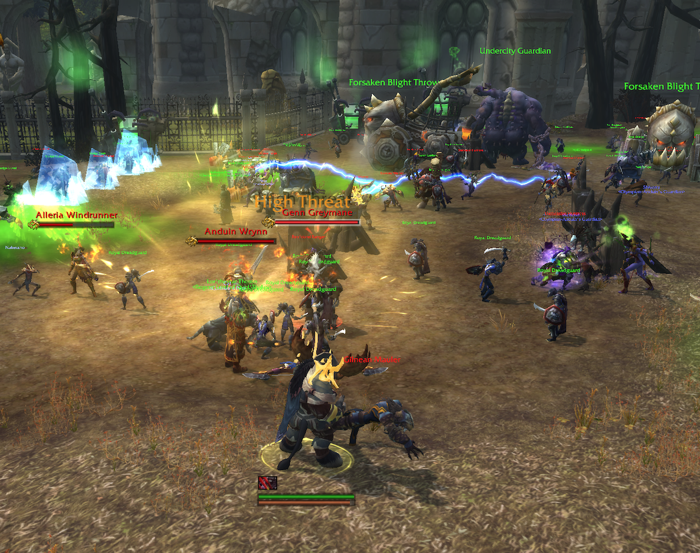 Several Horde characters fly in and walk into the palace. 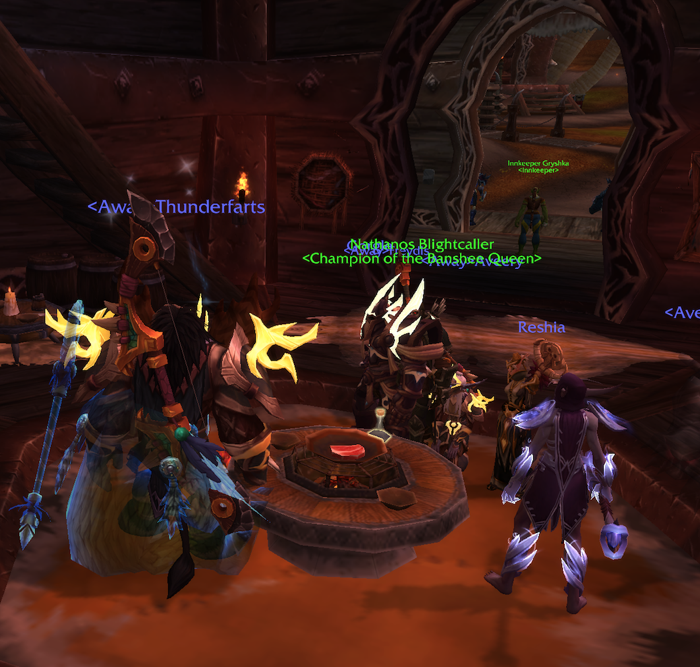 Later, I noticed that Horde NPCs with the title “ambassador” had arrived. 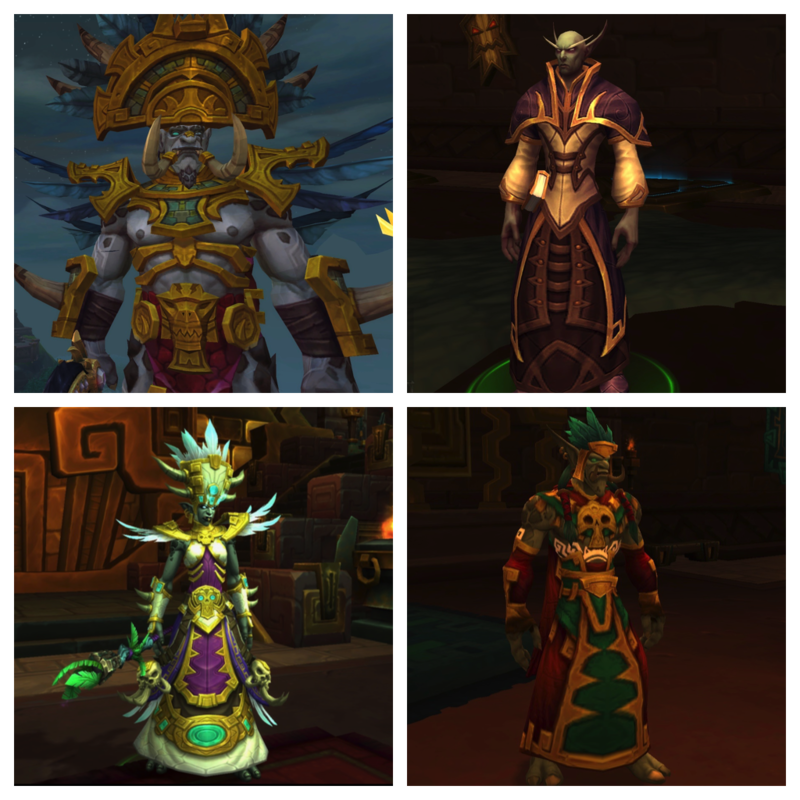 Here are some of the very fancy dressed NPCs that players encounter in this area: King Rastakahn, Chief Telemancer Oculeth, Princess Talanji, and Natal’hakata – Voice of the King. 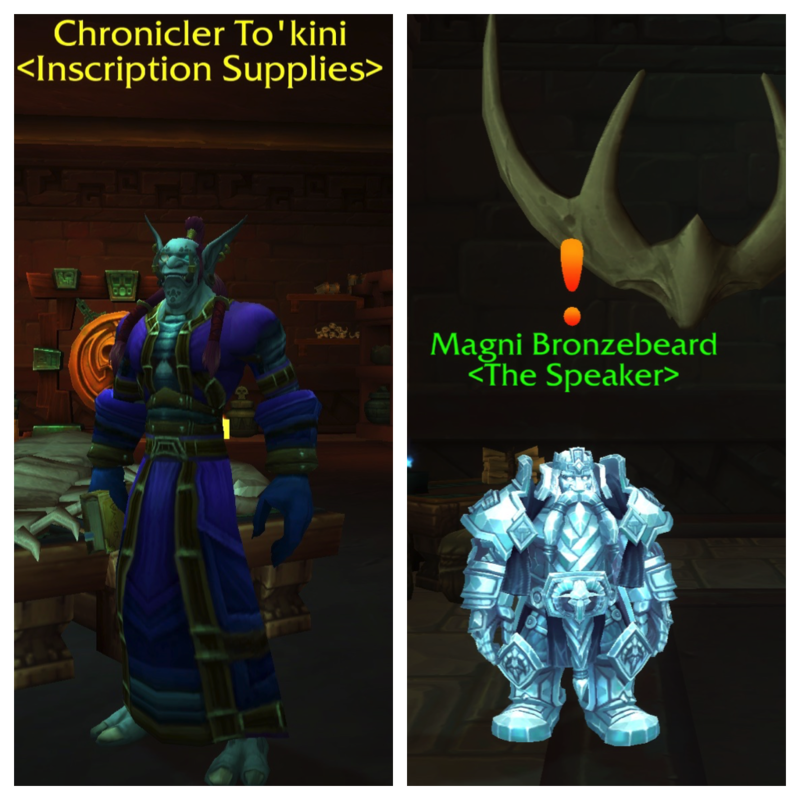 After speaking with Chronicler To’kini – Inscription Supplies – Magni Bronzebeard suddenly appears! I’ll leave you to watch the video above to see what happened next. Without giving away too many spoilers, I will say that part of what happens next gives the player character the Heart of Azeroth amulet. 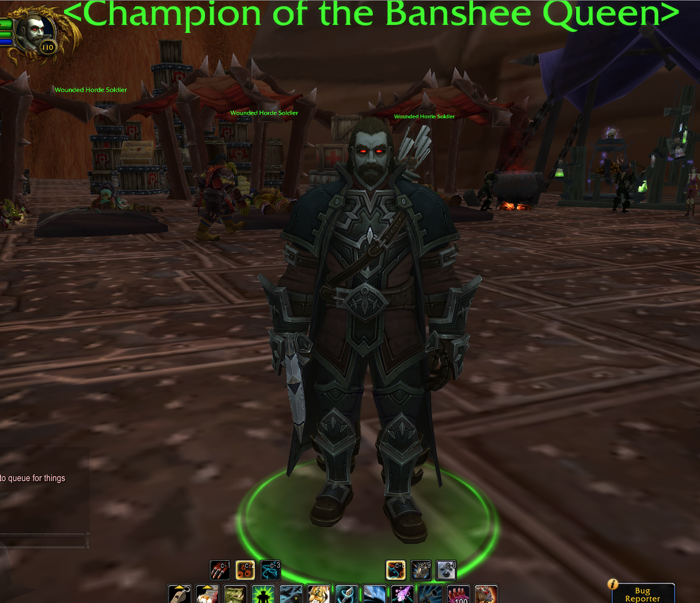 In the Alpha, my Void Elf (Alliance) already was wearing one of those – right from the start. The Heart of Azeroth is a significant item. 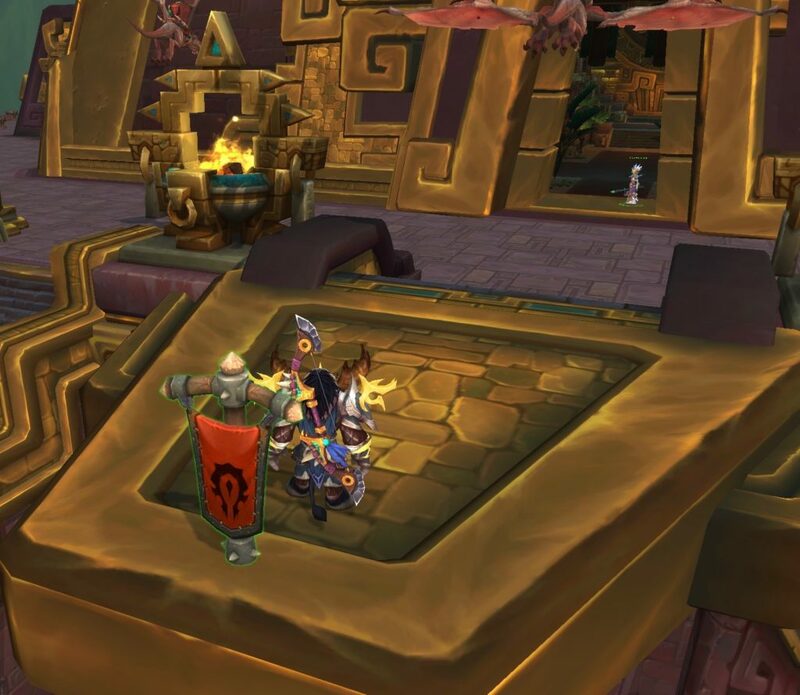 Welcome to Zandalar: Complete the introduction quests to Zandalar. Garhwa the Highmountain Tauren has completed all of the introduction quests here, and earned an Achievement. Obviously, this Achievement will only last as long as the Beta does. Things done in a beta do not count in the “live” game. Next, Garhwa must choose from one of three plans. I assume that players will need to complete all plans. I picked the one that requires a player to earn the trust of King Rastakhan. 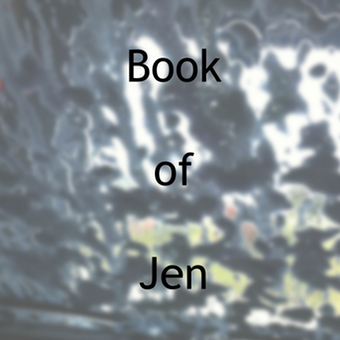 World of Warcraft: Battle for Azeroth Beta is a post written by Jen Thorpe on Book of Jen and is not allowed to be copied to other sites.